I work with the 12-13 year old boys at our church and the boys and I were tasked with planning an activity for the whole youth group. What we came up with was a large-group version of The Game of Life (no, not that one). We mostly held true to the original game but tailored the format so it could be played by up to 40 people. 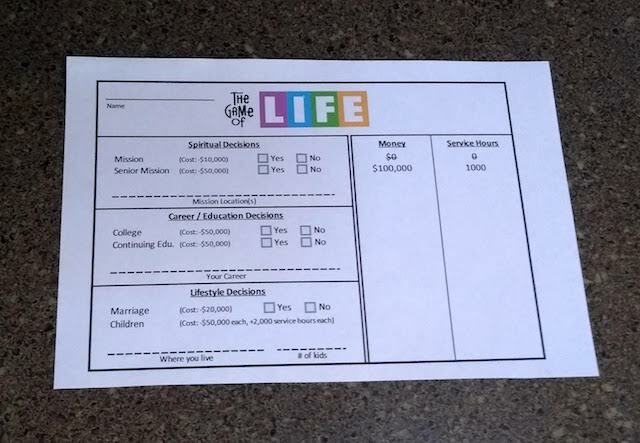 Instead of a game board, each person got a paper scorecard with some “life decisions” written on them. We changed some of the decisions to tailor them to this specific group (LDS youth). With each decision they made, they drew a chance card. The outcomes of these cards impacted their money and “service hours” (tracking service hours was an idea we borrowed from Boy Scouts). Throughout the game, they kept a running total of their money and service hours, seeing how much of each they could acquire. 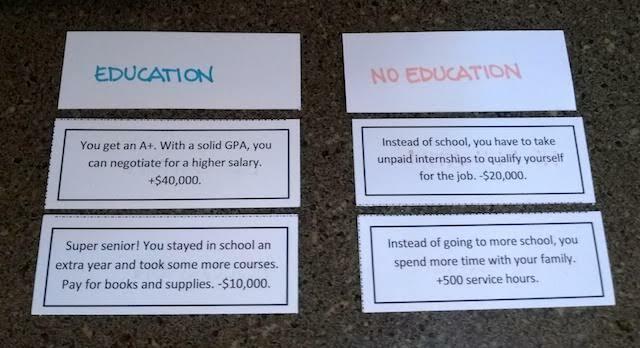 Decisions are about tradeoffs. You must often give up something to get something. Ultimately, you are responsible for your own decisions. A decision that’s right for you may not be right for someone else, and vice-versa. Good decisions don’t guarantee good outcomes and bad decisions don’t guarantee bad outcomes. The best decisions simply improve our chances of getting the outcomes we want. At the end of the day, money isn’t the only (nor is it the best) way to measure your success. All in all, the activity turned out really well. The youth enjoyed comparing their cards with each other and seeing how their lives turned out. If you’d like to try this for your own youth activity, all of the files (leader instructions, score cards, chance cards, etc.) can be downloaded here.